get really into battling a bunch of kids. Whilst they strolled down memory lane, a random patient named Pam overheard and becomes enamored with the couple, and even asks if they have kids because “mixed race babies are adorable,” which is a thing she said as Jake noted. 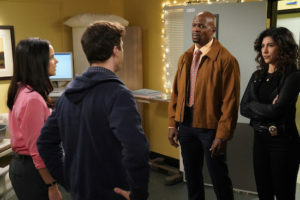 Amy says that they’re part of the plan, which makes Jake think she’s undercover but she in actuality wants kids someday. Amy thought that they’ve already had the discussion but when she was talking about wanting kids after seeing a picture of one of her nephews, Jake thought she wanted to go to a water park (because said nephew was at a water park). Side note: Jake’s feelings about water parks are 100% correct. They’re awesome. It is a bit out of character for Amy to have never brought up kids before or after the water park confusion. with an extensive list of qualifications. Amy and Jake go back and forth with a number of valid points such as the hours they work, how children add to their lives, and Jake’s daddy issues. Ultimately, Jake admits he’s scared about the potential of ruining a child’s life. want to wait around only for Jake to say he doesn’t want kids and then have to start over at 38.
they’re so cute (accurate), and Terry lists all the negatives of parenthood and how Jake needs to be 100% sure. parks are awesome. The episode ends with them thinking of names. -This episode being a bottle episode for Jake and Amy with the other characters sprinkled in.